In David Baldacci’s newest thriller, The Last Mile, he opens with a hook that grabs the reader and doesn’t let go for over 400 pages. The second book in Baldacci’s Amos Decker series introduces us to Melvin Mars, a man in the last minutes of spending time on death row for killing his parents twenty years earlier. Convinced there is no reprieve, Melvin mentally prepares himself for the final moments of his life when word comes through that someone else has confessed to the crimes he was convicted of committing. The world comes to a halt as he waits to find out what in the world this is all about. In a moment of serendipity, in another part of America, Amos Decker, an ex-police officer selected to participate in a special FBI group reviewing cold cases, learns of Mars’s situation. Decker had a short history with Mars when both played football in college, and his interest is piqued in this odd turn of events. The story picks up steam when Decker convinces the FBI team to look into this last minute stay and determine why it took 20 years for the purported killer to confess. Melvin Mars is released and works with the FBI team to learn more about Charles Montgomery, the man on death row in Alabama, who confessed to the murder of Mars’ parents. But things go awry when the authorities determine that Montgomery lied about murdering Mars’s parents, and Mars is once again collected and returned to prison. Baldacci has designed a maze of corridors that Decker and the FBI team follow, and as the team continues to uncover information, it becomes clear that the maze has many misleading trails. Mars’s re-incarceration is just one of those trails, and his subsequent second release is another. Decker is not beyond bending the law at times, especially when the FBI team is called back to Washington and ordered to drop the case. A bond develops between Decker and Mars, and in the background Decker is able to call upon his FBI boss, Ross Bogart, for help when things get dicey. And things do get dicey when Decker and Mars discover that the father Mars was supposed to have murdered is alive and well, and responsible for getting Mars off of death row after a 20-year lapse. To further complicate the matter, they learn that Mars’s father is not his father. A maze indeed! Just to keep the reader’s interest further piqued, Lisa Davenport, one of the FBI team, is kidnapped under everyone’s nose. This event draws the FBI deeper into the case and finding her alive becomes a primary concern of the team. No spoiler alert here! The story moves through the maze with more twists and turns until it reaches its logical conclusion, tying up all the loose ends. Baldacci has mastered the art of creating a page-turner for his fans. He draws his readers deep into his story by creating scenes that leave the reader suspended at the end of the chapter, unable to put the book down. Baldacci excels at developing interesting, three-dimensional protagonists, and he has given Decker an interesting personal situation—he has two characteristics that separate him from everyone else: hyperthymesia, an autobiographical memory, and synesthesia, a neurological condition of sensory pathways. He uses these two involuntary characteristics to help him resolve this case. 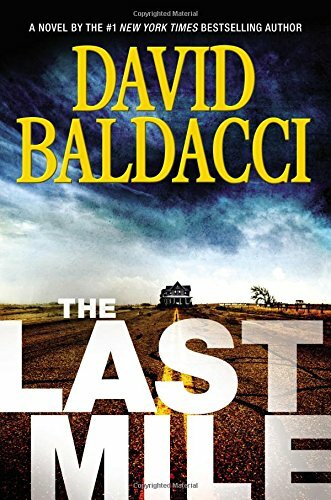 Baldacci fans will not be disappointed, and The Last Mile gives good reason to look forward to the next Amos Decker thriller.